Lucy Flannery is an award-winning writer with experience of radio, theatre, film, TV, fiction and non-fiction. Her short story Calm Down, Dear won The Brighton Prize 2015. Credits include A Business Affair [with Christopher Walken], Like a Daughter [with Alison Steadman], The Story of Tracey Beaker, Tomorrow Will Be Too Late and various magazines including Punch. 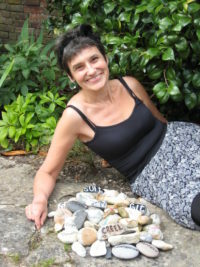 Lucy was the creator of Havant Literary Festival and a core writer for You, Me & Everyone, which has been confirmed by Arts Council England as the biggest crowd-sourced literary arts event in the UK. She is currently RLF Fellow at the University of Chichester. Great by birth, greater by marriage, greatest in her offspring – here lies the daughter, wife and mother of Henry. What a miserable epitaph for one of the bravest, strongest, toughest, most resourceful and most uncompromising women of the twelfth century – the Empress Matilda, Lady of the English. Henry I, the youngest son of William the Conqueror, had over twenty children but only two of them were legitimate – twins William and Matilda. William was his heir to both the throne of England and the Dukedom of Normandy but for his daughter he negotiated a splendid match; at the age of nine, she became the wife of the future Holy Roman Emperor, Henry V.
Matilda, who is also known by the Norman Mahaut or the Anglicised Maud or Maude, completed her education at her husband’s court, acquiring regnal, military and diplomatic skills in abundance. However there was no issue from this first marriage and after Henry’s death in 1125, no role for her at the German court either. Recalled to her father’s side at Rouen, the twenty five year old Matilda was appalled to find herself betrothed to Geoffrey, son of the Comte d’Anjou. The woman who had been an Empress and acted as her husband’s Regent in Italy was now ordered to marry a callow seventeen year old. Henry I squandered his daughter’s formidable gifts in an attempt to secure the south east boundaries of the Duchy of Normandy and subdue the often disloyal Fulk of Anjou. It was a massive error of judgement by him and one which was to have repercussions for all his subjects. Matilda’s brother William drowned on the White Ship in 1120. After the deaths of his son and his first wife Henry remarried, confident of producing more children. But the longed-for boy did not materialise leaving Matilda as his only legitimate heir. Spotting the danger a little late, Henry gathered his court together and forced them to swear allegiance to his daughter. Although the nobles went through the motions, they weren’t really about to allow themselves to be governed by an upstart Count like Anjou. Nobody even countenanced the notion of Matilda actually ruling in her own right. In 1134 Henry I died, famously, of a surfeit of lampreys and his nephew, Stephen of Blois, hurriedly crossed the Channel, secured the backing of the Church and seized the throne for himself. Matilda, pregnant in Anjou with her second son, was powerless to act. And that might very well have been that if it hadn’t been for one thing: the character of the Empress Matilda herself. Five years later, this most dangerous of women crossed the channel at the head of a force which included her redoubtable half-brother, Robert of Gloucester. Leaving behind her husband Geoffrey, now Comte d’Anjou, to capture Normandy, she enlisted the support of a number of English nobles and that of her uncle, David I of Scotland, and began a campaign against her usurping cousin. This vicious but relatively unknown civil war raged for eighteen years. The Anglo-Saxon Chronicle described it as a time when ‘Christ and his saints slept’. The peasants bore the brunt of the damage caused by the interminable hostilities; apart from the deaths sustained in battle, there were frequent famines caused by the destruction of crops and stock to prevent them falling into enemy hands. This was one of the grimmest periods of the entire Middle Ages, surpassed only by the plague-ridden fourteenth century and the bloodshed of the Wars of the Roses. In 1141, Matilda’s forces won a brilliant victory at Lincoln, capturing King Stephen. Now effective monarch, Matilda entered London in triumph and began planning her coronation at Westminster. But it was not to be. The City of London would not accept her and rose up in revolt, citing her arrogance and inflexibility. They also did not take kindly to the tax which Matilda proposed to levy upon them to bolster the royal revenues, sadly depleted after years of plunder as Stephen’s war chest. Matilda and her retinue had no choice but to flee for their lives. This wasn’t the only time she escaped by the skin of her teeth. An uprising in Winchester led by Stephen’s queen resulted in the Empress having to retreat to Devizes. Her brother Robert was captured in a desperate battle, fought as a decoy to divert attention away from her flight. Matilda agreed to free Stephen in exchange for his return; the advantage was lost but the war was far from over. Her most astonishing exploit was at Oxford. Robert returned briefly to Normandy to render support to Geoffrey who demanded this aid as the price for his continuing fealty. Taking advantage of his absence, Stephen managed to surround Matilda’s castle; recognising its near-impregnability he settled in for a long winter siege. The weather favoured him, soon turning to icy conditions. The snow lay deep around the castle, a vivid glistening backdrop to the relentless blockade. Just before Christmas, Matilda ordered white habits to be sewn for herself and a handful of companions. Her servants were distressed as they looked like winding sheets. The Empress and her liegemen wore the white hooded garments over their normal clothes as they escaped – some accounts say via the postern gate, some claim they were lowered from a window – into the town. Camouflaged against the snow, they galloped away with Matilda riding astride for the first time in her life. A blizzard overtook them but still they carried on to Wallingford, a distance of some fifteen miles. It was an extraordinary achievement. Following the death of her brother, never beaten but never wholly victorious, Matilda finally relinquished her claim to the throne in favour of that of her eldest son, Henry. She left England in 1148 following astute negotiations with the Bishop of Winchester which ensured that King Stephen recognised Henry as his official heir. After Stephen’s unexpected and sudden death, her diplomatic and administrative skills were fully exploited once more when she regularly acted as her son’s Regent in Normandy. Henry II was the founder of the Plantagenet dynasty and was a strikingly powerful monarch in his own lifetime, controlling an enormous territory which included England, Ireland, Wales, Normandy, Brittany and Aquitaine. Matilda never set foot in England again. Her strength of character, uncompromising pride and single-mindedness – those same qualities that made her father, grandfather and son outstandingly successful – made Matilda unnatural, shrewish, and a harridan. Even her fiscal acumen was turned into a weapon against her. But despite the disappointments and betrayals she was forced to weather, hers would be an enduring legacy. Thanks to her skill and shrewdness in securing the succession for her son, her dynasty ruled unopposed for centuries. And it may have taken four hundred years before England saw a female monarch – a descendant of Matilda through Edward III’s son, John of Gaunt – Mary I governing in her own right but five years later, Mary’s half–sister Elizabeth was crowned queen. And so began a reign which, partly due to those same characteristics of strength of mind and determination – not to mention a shared ability to command unwavering loyalty from fiercely intelligent men – is still looked upon as one of the most successful in British history and the glory of the Tudor period. Her great-to-the-power-of-eleven-grandmother would have been proud. Stephen and Matilda The Civil War of 1139-53 by Jim Bradbury. For an entertaining fictional depiction of Matilda, try Ken Follett’s The Pillars of the Earth.